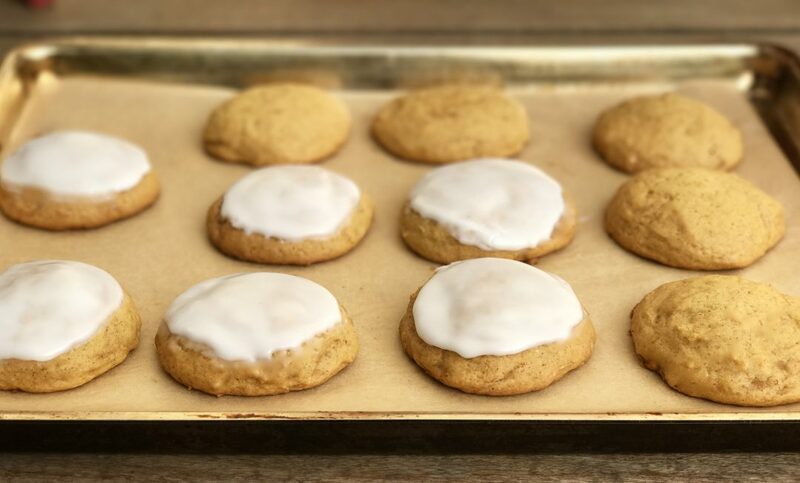 Frosted pumpkin cookies are a common request by my older son, these and my coconut cake that is. 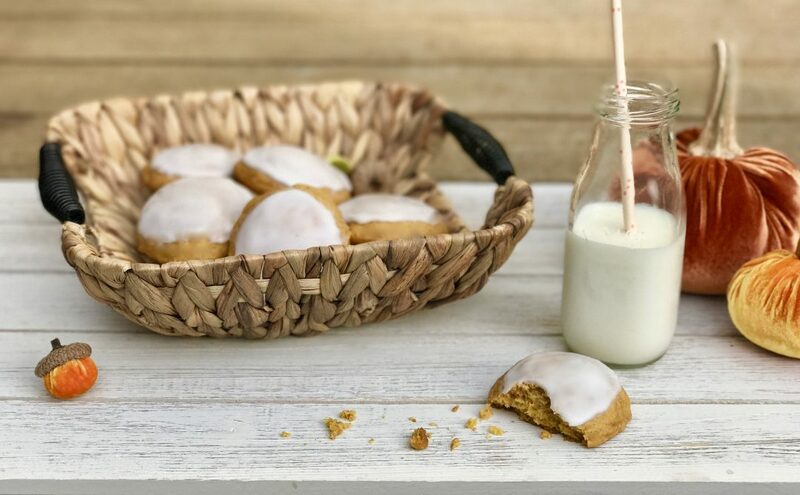 With just a subtle pumpkin flavor, these soft pillowy cookies are light on pumpkin flavor and not-too sweet, so the frosting is by no means overkill. I myself, love these as well. Serving these warm further enhances their subtle, yet delicious cinnamon and nutmeg flavor. 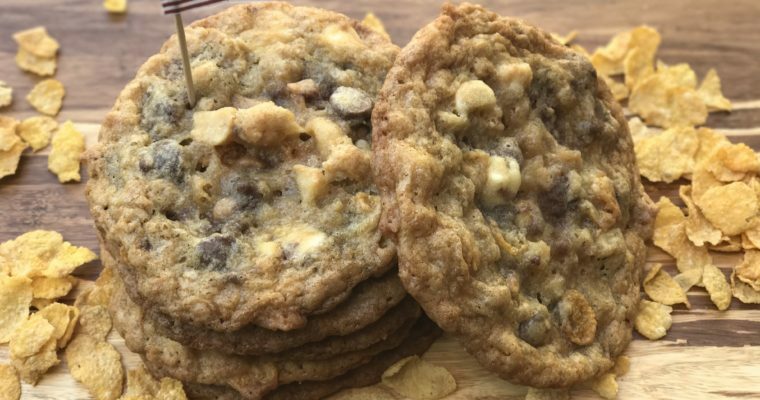 I’m not sure when I even began making these cookies, but they are almost effortless: you don’t even have to form them into dough balls before baking. Just drop them down in round blobs and they come out just fine. The fall season is just settling in, but the pumpkin-themed food items, snack and beverages have been here awhile already. Every year I swear Trader Joe’s doubles their pumpkin flavored offers: some good, some bad, but either way they put me in the Fall mood for sure. Pumpkin actually has some impressive health benefits, making “pumpkin season” and all the treats that come with it that much more enticing. On its own, pumpkin is low in calories, packed with fiber, high in vitamin A, and loaded with beta-carotene. I love using pumpkin in cooking, both sweet and savory, as it is a pretty neutral ingredient. Indeed, Libby’s canned pure pumpkin can be use in both sweet and savory dishes with ease. Libby’s now offers an organic version that I love, though it can be a bit harder to find. But keep looking, it’s out there. Fall and baking are synonymous to me–a warm oven and the smell of cinnamon is comforting and inviting. 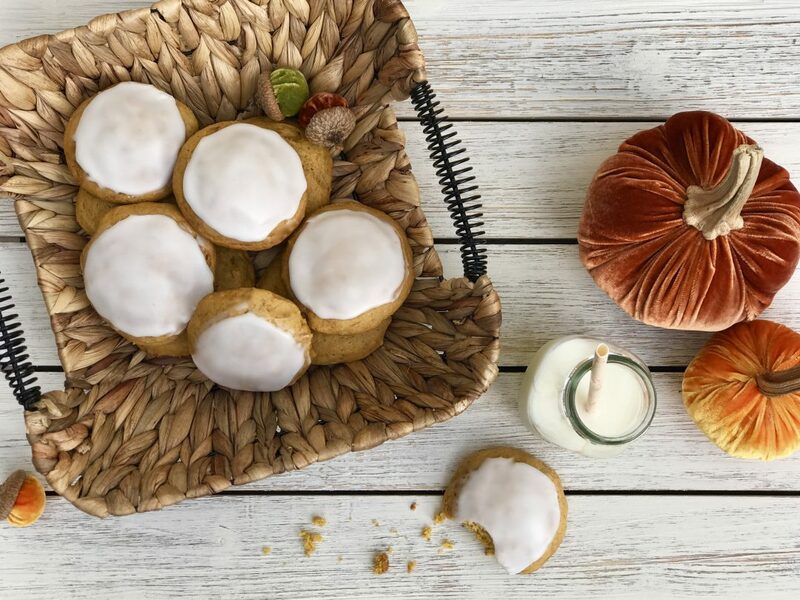 These yummy cookies are a must try for all pumpkin lovers out there. If you are in the Fall baking mood but not a pumpkin fan, be sure to try my super easy chocolate chip banana bread, which is also a big hit with the kids. 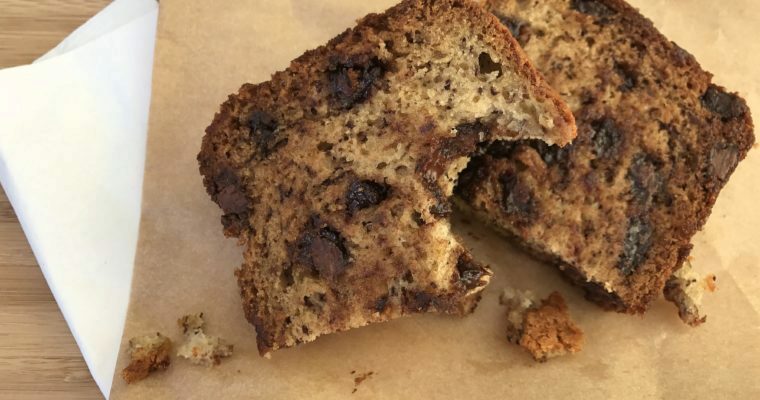 You can also try making it without chocolate chips for a more classic style banana bread, which is how I make it for myself. Step 1 Preheat the oven to 350 degrees F. Line two baking sheets with parchment paper and set aside. Step 2 In a large mixing bowl add the flour, baking soda, baking, power, cinnamon, nutmeg and salt. Mix well. Step 3 In a separate bowl add the pumpkin puree, egg and vanilla extract and whisk until smooth. Step 4 Using a kitchen mixer, such as a KitchenAid, fitted with a paddle attachment, beat the butter and sugar until well blended. Step 5 With the mixer on low, gradually add the dry ingredients to the butter-sugar mixture alternating with the wet ingredients. Mix well to incorporate. Step 6 Drop generous tablespoons of batter onto the prepared baking sheets leaving enough room between each cookie. Bake for 10-12 minutes until firm. Cool slightly. Step 7 For the frosting: In a small mixing bowl, add the sugar, water and vanilla extract. Mix well and allow to sit for a couple of minutes to thicken. Step 8 Once the cookies have cooled, use an offset spatula to frost the cookies. M and I made these, and they were a big hit! No surprise! 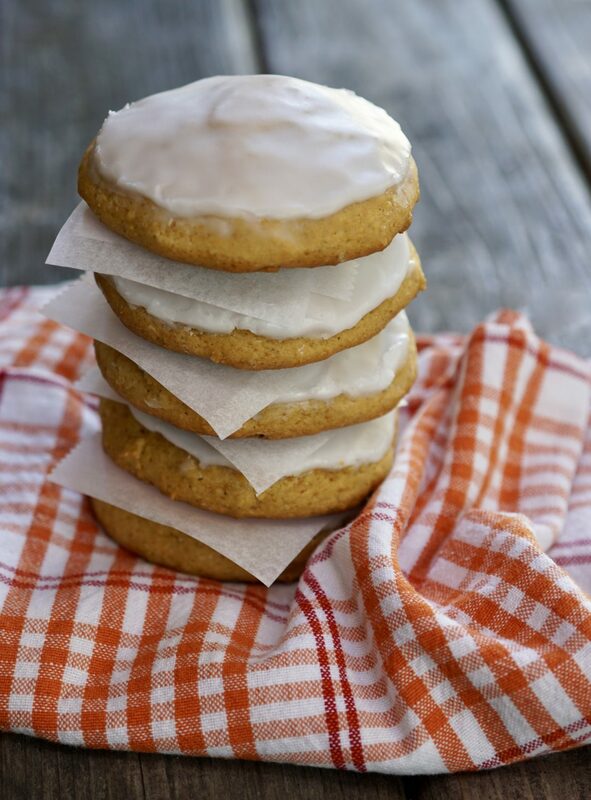 A perfect fall cookie.